Amid sounds of music and video of Kosovo’s heritage sites, EU office in Pristina and UNDP launched the EU funded “Inter-Community Dialogue through Inclusive Cultural Heritage Preservation project. 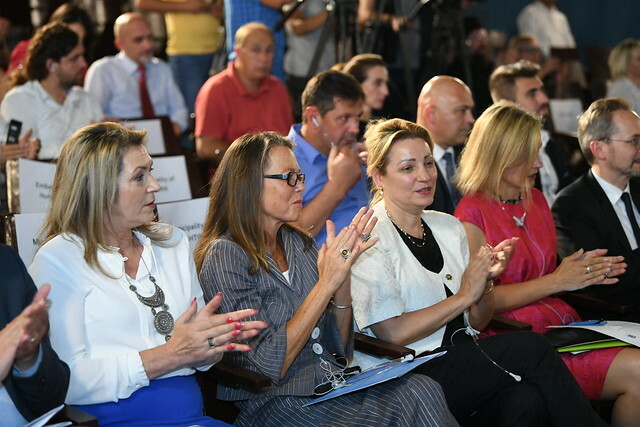 that will will restore, rehabilitate and beautify cultural and religious sites that across Kosovo including capital Pristina, historical Prizren, Pejë/Peć, Gjakovë/Djakovica, Zveçan/Zvečan, Graçanica/Gračanica, among others. The works will enhance the visibility of monuments and promote the understanding and acceptance of a community’s heritage as well as encourage tourism thus contributing to the promotion of cultural heritage of communities. Lumbardhi Cinema in Prizren hosted the event in which a number of distinguished guests, among them Nataliya Apostolova, Head of EU Office in Kosovo/EU Special Representative, Ulrika Richardson, UN Development Coordinator and UNDP Resident Representative, Deputy Minister of Culture, Youth and Sport Burbuqe Bakija Deva, representatives of diplomatic corps, religious leaders international and local partners, mayors, CSO and NGO representatives participated. "Throughout the year, Europe will celebrate our diverse cultural heritage at the EU, national, regional and local levels. Cultural diversity is an integral part of the values of the European Union. Many activities foreseen in this EU-funded project will aim to draw communities closer together on the basis of the common heritage they share and to develop local capacities for protecting and preserving cultural heritage, particularly through engaging women and young people," said Ms. Apostolova in her opening remarks. Ulrika Richardson emphasized the importance of the project and hat it will focus on: "Through this project, we will promote the increased involvement of young men and women in preserving arts and crafts and that way facilitate the rich cultural heritage in Kosovo to become a vehicle for inter- community dialogue and social inclusion." Deputy Minister of Culture, Youth and Sports, Burbuqe Bakija Deva in her address acknowledged the efforts and the work of many actors in this field to preserve the cultural heritage in Kosovo. Guests at the event had the pleasure of hearing the video message by Mr. Tibor Navracsics, European Commissioner for Education, Culture, Youth and Sport who said: "Prizren, a city with a rich history and diverse cultural heritage is a fitting place to host this event. You are starting this event at a time when the spotlight is firmly on cultural heritage. The 2018 European Year of Cultural Heritage is well underway." One of the sites that will be renovated through the project will be the very site where the launch took place, the Lumbardhi Cinema. Ares Shporta, co-founder and director of the Lumbardhi Foundation presented a short history of the cinema focusing on its importance as a cultural venue bringing people together and gave a short tour of the facility to the guests gathered at the launch of the project. The project “Inter-Community Dialogue through Inclusive Cultural Heritage Preservation” builds on the project “Confidence Building through Cultural Protection in Kosovo” also funded by EU’s Instrument contributing to Stability and Peace (IcSP). It was implemented from 2016 to 2017 and has strengthened inter-community trust and respect for cultural identity and heritage in the municipalities of Ferizaj/Uroševac, Gjilan/Gnjilane, Lipjan/Lipljan, Kamenicë/Kamenica, and Rahovec/Orahovac. In addition, the IcSP contributes to peace-building and to stabilisation measures in the Western Balkans with several projects in the region, including via support to dialogue across communities in the region. With a total budget of just under EUR 2 million, the project will focus on renovation, beautification and rehabilitation of selected sites and will raise awareness about cultural diversity while encouraging citizens to protect and preserve cultural heritage. The project also has a strong youth and women’s engagement component which supports economic empowerment through re-imagining of cultural heritage as means of economic empowerment. The overall aim of the project is to contribute to improved inter-community tolerance and respect for cultural identity and heritage.